Automatic milking systems were designed and conceived with the idea of minimising the human labour component around milk harvesting and thereby provide farmers the capacity to combine the activity of milking cows with an improved and more flexible lifestyle. Yet, there are still many other tasks that need to be completed on farm such as managing pasture and feeding of animals, breeding cows, rearing calves and heifers, managing milk quality and animal health, as well as general farm maintenance tasks and managing farm business strategy. Whilst milking becomes a background operation with robotic systems, there are still some milking related tasks to be conducted, including changing milk filters and commencing wash cycle, hosing out robots and holding yards, fetching any cows that don’t present at the dairy in a timely manner, cleaning external surfaces of the robots and monitor reports and alerts that are generated on the computer. The monitoring is an integral aspect of the routines that cannot be dismissed. The increasing adoption rate of automation and technology such as electronic animal identification, automatic cup removers and auto-drafting gates have made it possible to milk a greater number of cows with less labour units and more cows per hour. Despite this the national average labour efficiency continues to hover around 100 cows/FTE (Full Time Equivalent = 50 hours of labour). Robotic milking systems are probably the most significant and relatively recent technology that can create a positive impact on the labour efficiency of our farm systems and the dairy industry as a whole. 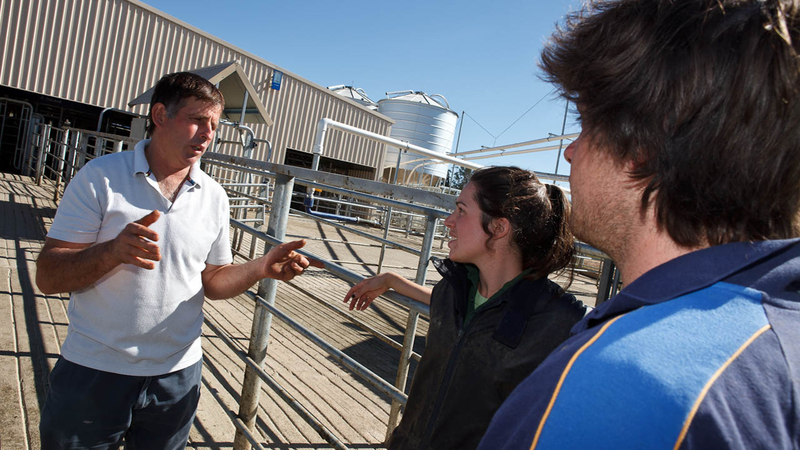 As part of the FutureDairy Project, Mr Juan Molfino conducted labour audits on 5 commercial AMS farms to understand the impact of AMS on labour and lifestyle of pasture-based farms within the Australian dairy industry. Each farmer was monitored during 12 months to capture general information relating to labour and time management. Labour efficiency ranged between 100 and 273 cows/Full time equivalent (1 FTE = 50hs per week). All 5 AMS farmers stated that AMS had a positive impact on their quality of life and that their expectations around the impact of the technology were successfully fulfilled. To access the labour case studies that resulted from the audits on AMS farms, please refer to Future Dairy’s website.